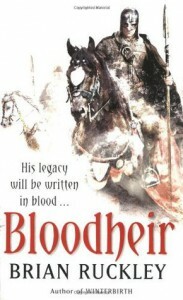 Bloodheir is Ruckley's second novel in his Godless World series. I'm enjoying this series a bit more than Abercrombies' (see my review of Last Argument of Kings) because it isn't quite so cynical and hopeless, and there are some characters who believe a better world is possible. Not necessarily easy, though. The world is godless because it's been abandoned by its makers (at least that's the mythology) which leaves its hapless inhabitants to their own devices. I think Abercrombie is better at drawing distinct characters than Ruckley but Ruckley's are just as believable and compelling. He's also avoided the problem (so far) of making a character too powerful. One of the things that annoyed me about Last Argument of Kings at the end was Bayaz's evolution into an omnipotent deus ex machina. The primary villains of the Godless World are believably fallible and believably motivated (in fact, like all "villains" they don't believe they're evil at all). I am interested in where Ruckley's going to take his story so I await Fall of Thanes with pleasant anticipation.